With the world still failing to come to terms with the sensational moments of genius and madness that led to Real Madrid defeating Liverpool in the Champions League final on Saturday night, a major Bollywood star has shed some much-needed light! Real Madrid beat Liverpool 3-1 in a truly shocking showpiece final, with a player from each side coming to the fore for very different reasons. For Liverpool, that player was German Keeper Loris Karius, who made key mistakes in two of Madrid’s three goals. For Real Madrid, meanwhile, that player was Welsh wing wizard Gareth Bale who scored what may be the greatest goal in the history of major football finals (as well as one of the two goals that were caused by Karius’ mistakes). Saturday night saw a win that left many in awe of Gareth Bale’s talent and also saw Liverpool fans lose their dream of winning a championship after 11 years. Real Madrid went on to win the Champions League 3-1 all thanks to Gareth Bale. Real Madrid beat Liverpool in a truly shocking showpiece final, with a player from each side coming to the fore for very different reasons. For Liverpool, that player was German Keeper Loris Karius, who made key mistakes in two of Madrid’s three goals and their key striker Mo Salah’s exit due to injury caused by Madrid’s Sergio Ramos. But for Real Madrid, meanwhile, that player was Welsh wing wizard Gareth Bale who scored what may be the greatest goal in the history of major football finals. 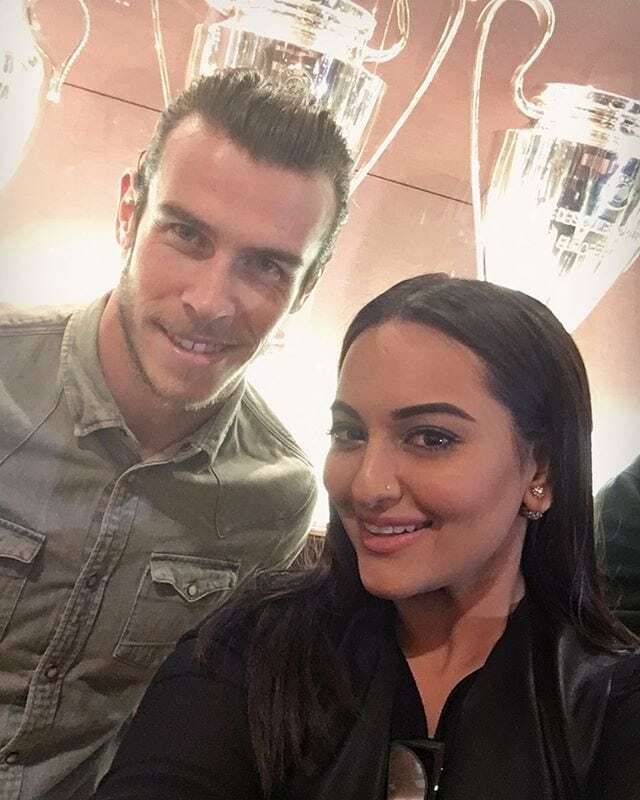 Sonakshi, who has worked hard on her fitness, apart from the selfie shared a picture of her playing the football with Gareth Bale. “#Sundayselfie with the champion @garethbale11! That last goal was such a burn,” the actress captioned the images. The Bollywood actress is fast becoming a fitness inspiration and looks absolute fit these days. Recently, on body-shaming, the actress shared her views and said it’s important for the audience to rise above looks. “I have always been projecting a very strong body image. Being true to yourself… I have been bodyshamed quite a bit but moving ahead of that because that is what I have always believed in…That it’s not how you look but how you do and about how many people you reach out to,” she was quoted as saying by IANS. The pair had actually met in 2016 when the IIFA awards were held in Madrid. 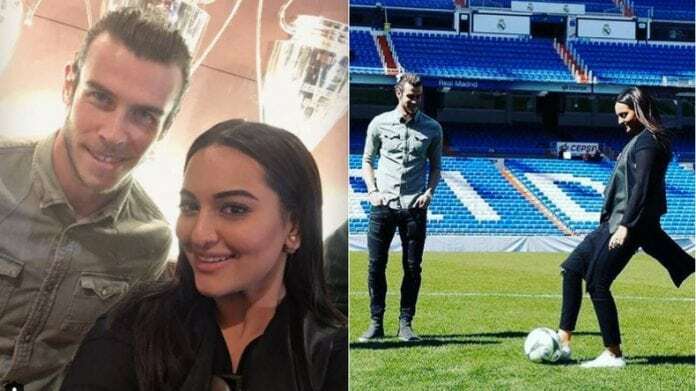 A Bollywood delegation comprising Sonakshi Sinha, Anil Kapoor and Hrithik Roshan had met Luka Modric, Gareth Bale and Karim Benzema, all of whom played key roles in Real Madrid’s win.